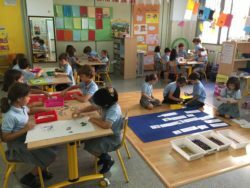 The International Diocesan Virgen de Gracia School in Granada welcome students in their first educational stage . Elementary goes from 6 to 12 years old and is divided into 6 formative school years that encourage children to achieve Upper and Middle School. The Semi-opened system in our Primary School from Granada. The Semi-opened system includes a gradual and sistematic transition where each child is different in his cognitive capacity, his own interests and his way of working and learning. In our School each child has the opportunity of self development at his own pace in an environment of collaboration, safety and respect. Students are in one of the Montessori developmental stage where they start to think by themselves and where they work independentely. As in the previous stage, they continue discovering their environment and themselves in a natural way . The level of difficulty increases gradually. All our students begin to reason those knowledges they acquired before. In our School each child has the opportunity of self development at his own pace in an environment of collaboration, safety and respect. Important aspects of our Semi –opened system in Elementary. Children are willing to learn. They develop their personality through active participation. They accept rules previously discussed in a group of students. They reason what they learned. We allow freedom of movement in our classrooms. We have specific materials in each area. We keep discovering hidden talents. 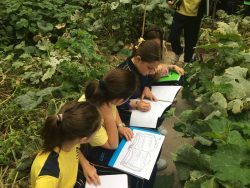 We bet on an experimental learning where we detect our students’ hidden talents on each stage In this way teachers, as mentors, could propose a personalized educational process for each child. This helps him to complete his own development and achieve common objectives. Keep up individual and collective learning. Come up with meaningful activities. Develop interperosnal and intrapersonal habilities to promote a succesful future. We thrive giving each of our students the opportunity to satisfy their potential in order to be a responsable, safe and balanced human being.